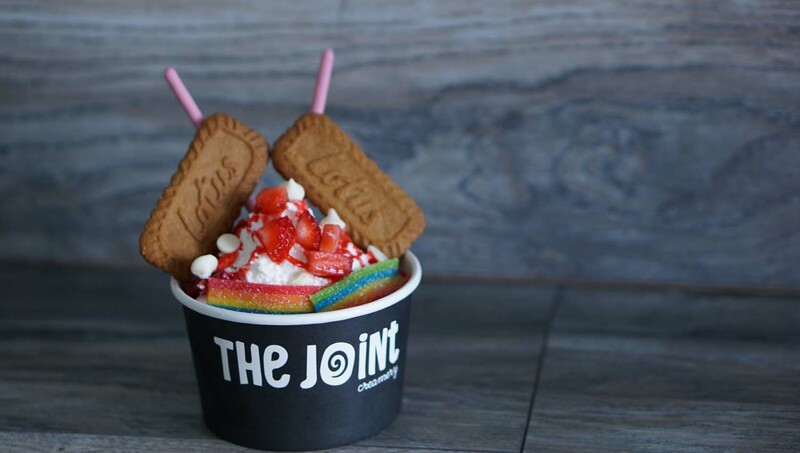 The Best Rolled Joints Are In Ice Cream Form! @ The Joint Creamery - Garden Grove - EAT WITH HOP! Rolling Joints? Ice Cream? Rolled Ice Cream?! Alright. I know what you might be thinking. Enough is enough. 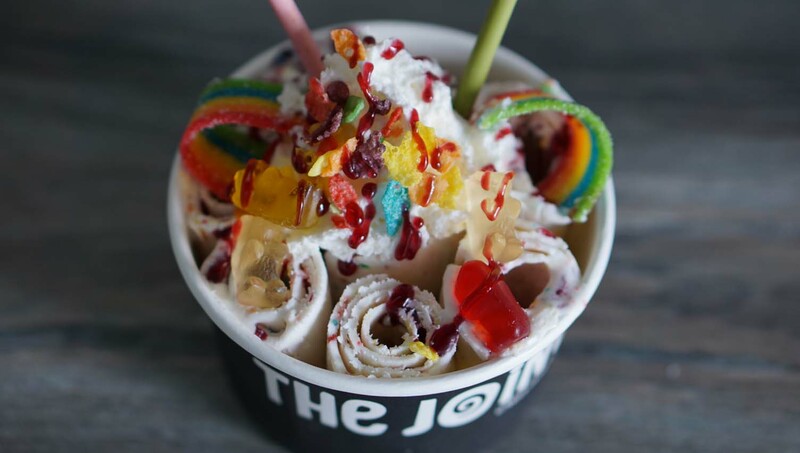 Rolled ice cream seems to be popping up in every corner possible in the Orange County area. And you're probably thinking what's the point of trying another one. They're all the same right? More competition means more innovation and better products. And even though there are many rolled ice cream dessert shops nowadays, it doesn't mean they are all the same (Rolled ice cream guide coming soon folks). 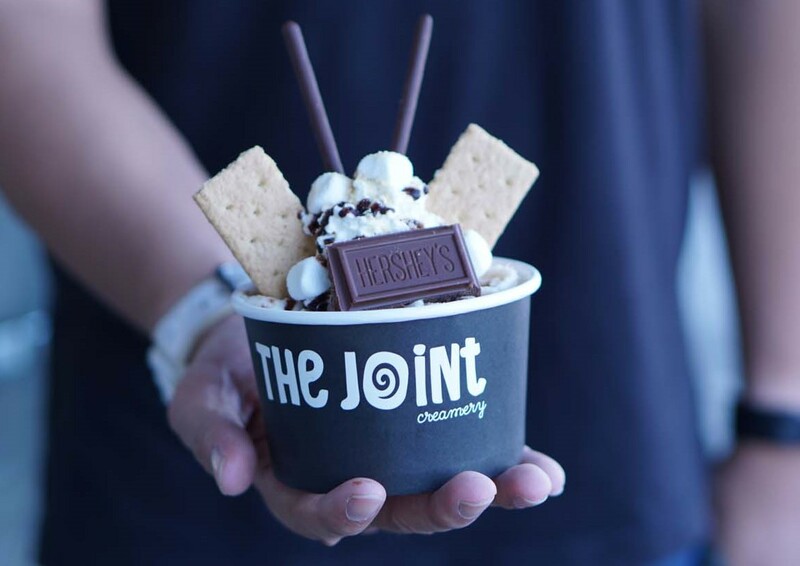 The Joint Creamery stands out above the rest with it's unique flavors, aesthetic presentation, great customer service, and most important of all The Joint Creamery delivers great taste. 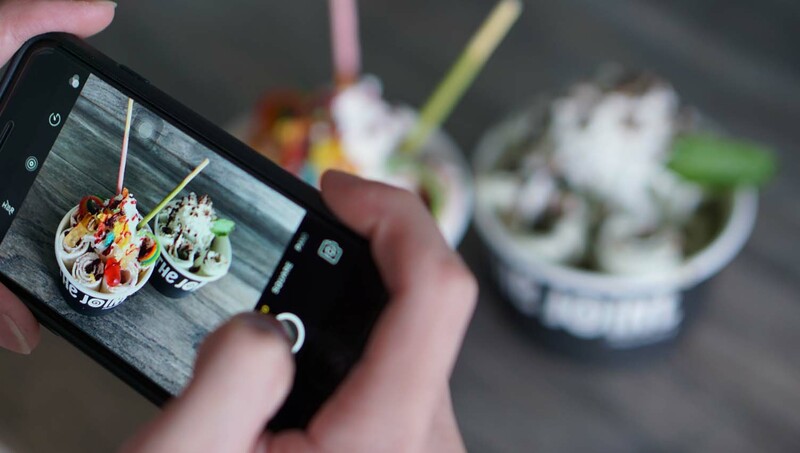 Not only does the ice cream look cool for da `gram, but it actually tastes delicious too! I had the opportunity to try out the place as media and was so surprised by the amount of flavors they have! The Joint Creamery opened recently a couple months ago but due to some paperwork issues and misunderstandings, (nothing bad happened, I assure you! ), the dessert joint had to close down for awhile. BUMMER! A friend of mine was craving desserts and we wanted to try something new. We actually went to The Joint Creamery during it's random temporary closure and were surprised. Luckily though, the owners were there and were so nice to even talk to us and give us some $1 off coupons! Yay for customer service! Luckily, the shop is now open and ready to serve everyone! On our visit, Kevin and I also got to get a special sneak peak of their new dairy-free flavors in the works. Kevin is lactose intolerant, so naturally he can't eat that much ice cream or his tummy will get all rumbly.... yaknow ? Thankfully, more places are catering to this lactose intolerant demographic by offering dairy-free options! WOO! The owner made us mango rolled ice cream which tasted very fresh and the mango flavor was very apparent. I really enjoyed it and so did Kevin! However, the texture itself needs a little bit of work. It wasn't creamy since there is no milk involved. But hopefully the texture will improve in the future! This is still in the works, and I hope they will release it soon! Upon walking into the store, you'll notice their wall full of fun and quirky quotes. Maybe some dirty quotes in there too. But mostly punny! All the rollllllls be looking so delicious! And tastes even better than it looks! and Mint Chocolate Chip Andes which they call MINT TO BE! Such cute names for each creation they have! My fave is definitely the mint to be. I ate that so much and recommended that to everyone! But I think "Mint To Be" is still my number one favorite flavor here! Everyone here is so friendly! I wanted to get a deeper look at how they make their rolls so what better way then to ask them to teach me? One of the staff members showed me their technique on how to lay out the base on the ice plate, spread it around, then flatten it and eventually roll it all up! I was so amazed and the experience was extremely cool (literally, because of the ice plate!) to learn. Anyone wanna hire me now? I'll make ya rolled ice cream! 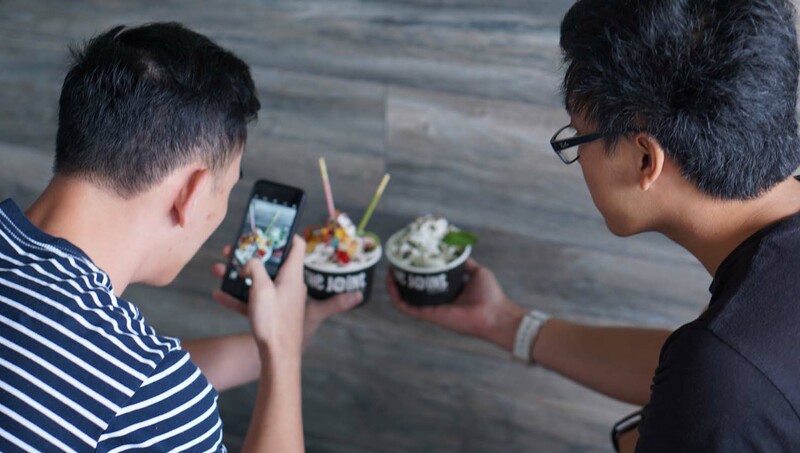 Every single ice cream base here is made fresh with recipes concocted by the owners themselves, which actually took several months of research and development. The result is a cup filled with satisfying and creamy rolls packed with flavor! But not too overbearing either. It's well balanced and untiring. 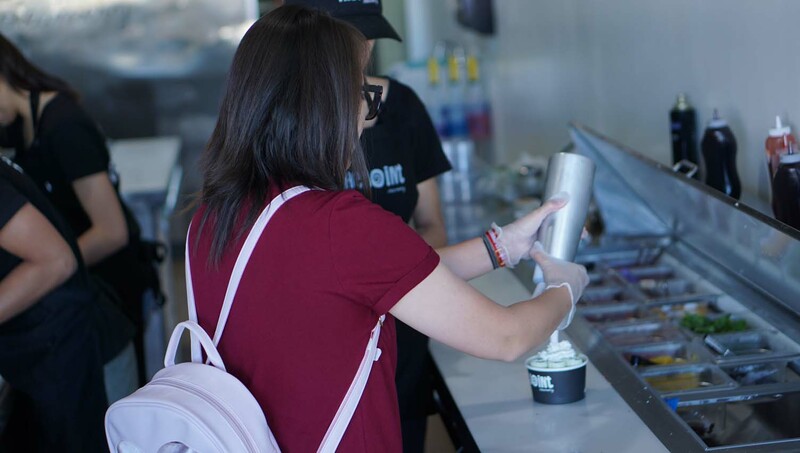 Since I recommended the "Mint To Be" flavor to practically everyone, the owner Danny, had to run to the back to prepare more base mixes. That flavor is toooooo good! 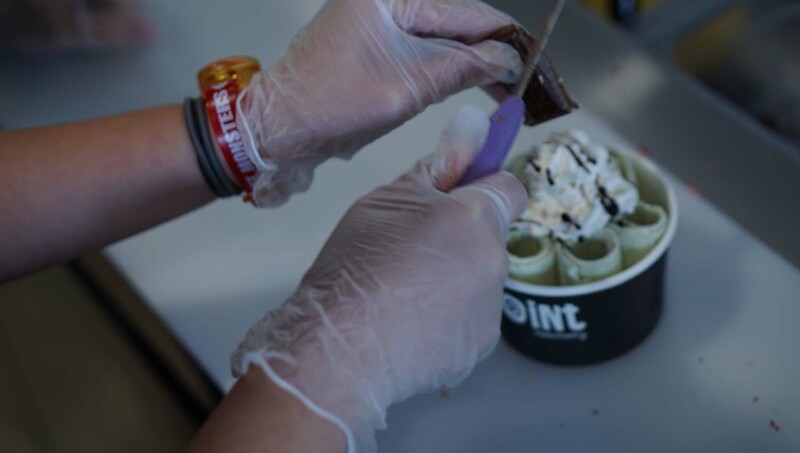 While decorating my ice cream rolls, the staff taught me how to make the chocolate shavings. This was one of those moments where I really felt like this dessert shop cares about their product. They could have just made it easy on themselves and just buy chocolate shavings. But instead, they have chocolate bars here that they use to actually shave it with a knife/shaver (??) to top off their creations. My friend @ViaFood also rolled in to join(t) me at The Joint Creamery! He's doin` work as you can see, taking some nice shots of the ice cream rolls! The Panda is basically their version of cookies and cream oreos flavored ice cream rolls! This was very creamy and very flavorful! I love the taste of cookies in each bite! It's also @eatingwitheatingwithhop's (Danny, as in Kevin's cousin) second favorite after the Mint To Be! And, the Panda is cutely decorated with some Hello Panda crackers! 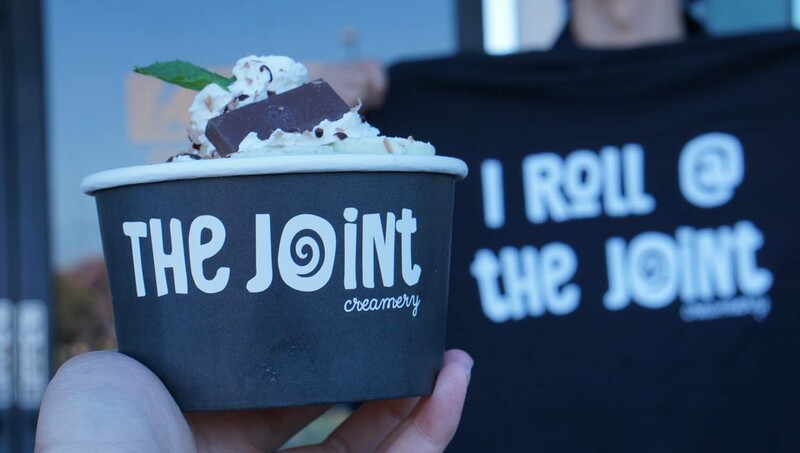 ARE YOU READY TO ROLL INTO THE JOINT CREAMERY? 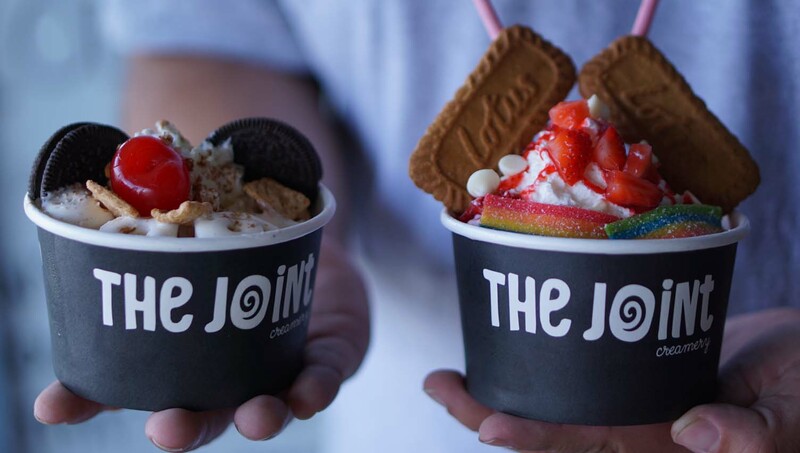 So the Joint Creamery is finally officially open in town! 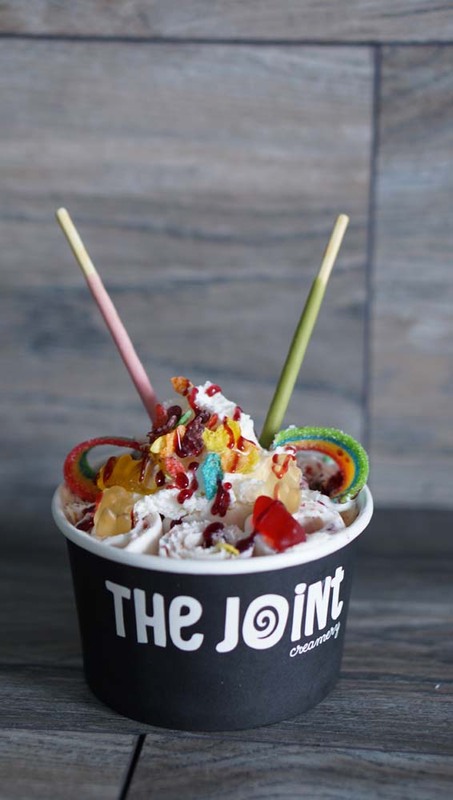 This dessert shop is located in Garden Grove and while it's among many other rolled ice cream shops poppin` up everywhere, it is determined to stand out and make a memorable impact on your taste buds! I got to meet up with the owner, Danny, and learned about how he got the idea to open up the Joint Creamery. 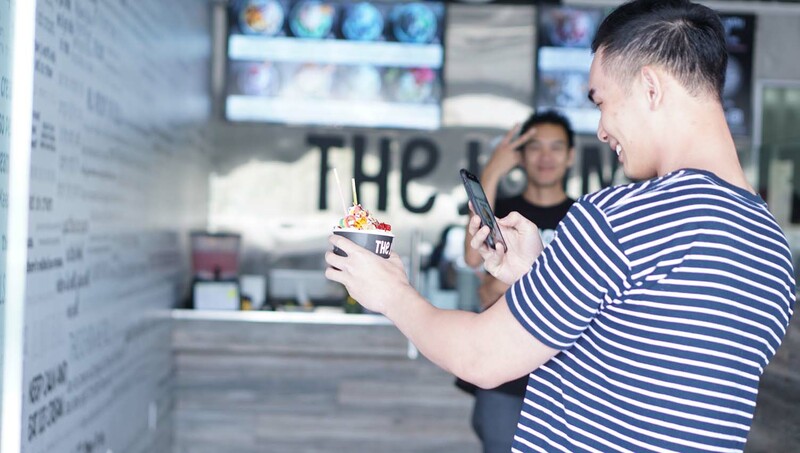 It was after traveling to New York City and noticing the rolled ice cream shops over there, that he wanted to bring the fun experience back to his hometown in Garden Grove. In New York, just being able to watch your ice cream be freshly made in front with all the fresh ingredients is just such a cool and novel experience. So I am glad that Danny finally brought his own vision and version of this to life in Garden Grove! The Joint Creamery actually used to be a vape shop. Actually, the sign for it on the board is still there: Vape n` Mods. But the vaping industry wasn't going to well so changed had to be done. A new concept needed to be introduced. 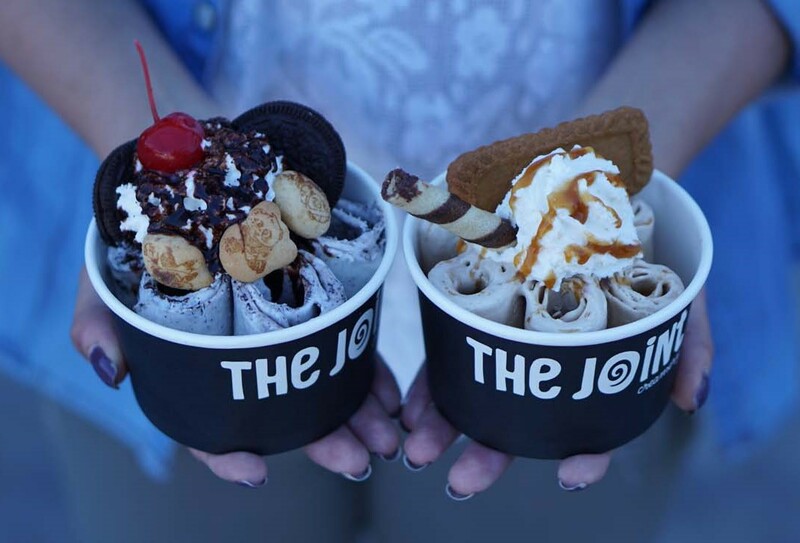 This was already awhile ago before any rolled ice cream place even existed in Orange County, that the vision of The Joint Creamery was already starting to begin. The owners wanted to make it a reality and decided, if anyone's gonna do it, they have to do it themselves. So owners Danny and Kelvin sought out to build the store with their very own hands. Everything you see once you walk in was built by them, through all that sweat and hard work. If you're a kid, go here. Every kid gets a helium balloon! Like, they literally have a helium tank in the back especially to inflate balloons to hand out to any children ordering from them! And if you're not a kid, everyone will still serve you with a smile! So here is the important part, how does the ice cream actually taste!? Mint To Be (Mint Andes Chocolate Chip): Obviously my favorite one if you haven't figured it out already. This flavor is not too overbearing and well balanced in mint and chocolate. They even top it all off with an Andes mint chocolate candy! WOO! And... a real mint leaf! So refreshing! Texture is creamy and smooth. 10/10 recommend. 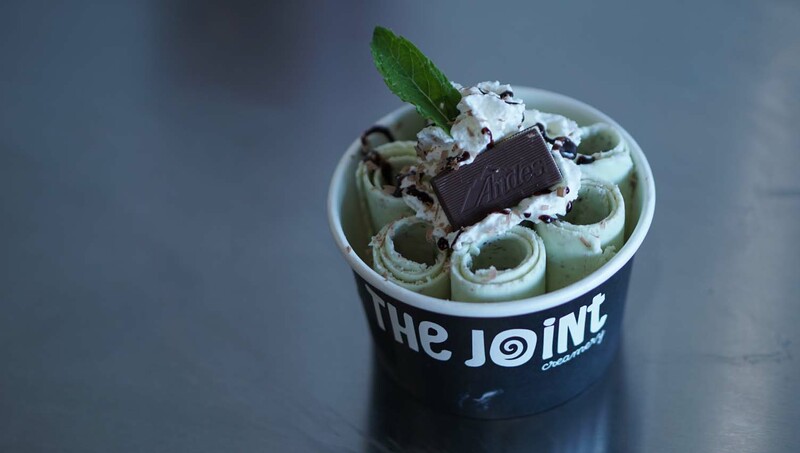 Also, I prefer this Mint ice cream roll over Rolling Creamery (Fountain Valley) way waaaaaaay more. The one at Rolling Creamery is too overbearing to the point that the artificial mint (assuming here but it does taste artificial) leaves a weird taste in my mouth. The Forbidden (Durian): Actually I was sort of disappointed with this one. It didn't taste as "forbidden" as I had hoped. I don't think anyone would have forbid me from speaking to them because I had no durian breath from eating this. The ice cream rolls itself did not seem to emit and durian smells either. @Wong.Foodie (Alice) and I agreed that it tasted more like... well just cream. It did taste a bit like durian the more we ate it but we really had to think about it. Panda (Cookies and Cream): This is one of my favorites. There is a good amount of oreo flavor and the entire thing is creamy and smooth and delicious! Campfire Munchies (S'mores): Also very delicious! Can't go wrong with this flavor either if you love s'mores! There are even graham cracker bits too! Rainbow Mountain (Fruity Pebbles): This is not your ordinary fruity pebbles. The rolls also are infused with raspberry sauce too! This is overall very sweet but yet very Instagram-worthy. Get this if you have a major sweet tooth! It comes with the rainbow airheads sours candy too! The Galaxy (Black Sesame): The reason why this is called the galaxy I suppose is because it also has blue and purple sprinkles on top which makes it very pretty! I actually prefer very strong black sesame flavors where it might be too "seedy" to some others so the Joint Creamery version was very "light" and milky for me. It was good still but not what I would prefer. Some of my other friends enjoyed it though for the very fact that it is more subtle. Strawberry Dream (Strawberry): tastes very natural and delicious! Not overbearing at all and creamy and yummy! Would recommend if you are a strawberry fan! Purple Rain (Taro): This was delicious! Great flavor that isn't overbearing and just the right amount of creaminess. OG.T (green tea): Don't confuse this with matcha. It's just green tea and it reminds me of the green tea at Sweet Cup actually. Which is .... light in flavor. It reminds me of .... teazone green tea? It's pretty good but not what I prefer because y'all know me, I am a #matchasnob. @EatDrinkLoveJen enjoyed this because it's well-balanced and not strong green tea! When it comes to green tea, I prefer the Rolling Creamery (Fountain Valley) version just because it tastes like the Matcha Oreo Cookies! There are so many other flavors that I haven't tried that is on my list up next time I come in! dirty horchata: this has been calling my name ever since but I have yet to try it! Have you tried it? Tell me... is it worth? I need to try! it's called "dirty" because there are graham crackers on top which makes it look like "dirt"
viet coffee: I love Vietnamese coffee so this sounds really yum! All ice cream rolls are $6. All set flavors. You can add toppings on top though, but I don't think it's necessary because all the flavors are well thought-out with toppings that complement each one already. WHICH FLAVOR WOULD YOU ORDER?